Contrasting blooms of purple, green and yellow create an original and beautiful expression of sympathy and sorrow, eminently appropriate for celebrating a life that has passed. 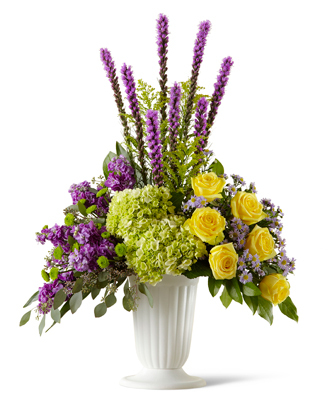 This stately arrangement handcrafted by a local artisan florist features an eye catching silhouette of purple liatris stretching heavenward surrounded by yellow roses, purple stock, lavender Monte Casinos and green hydrangea and button poms in a pedestal urn with the look of fine white ceramic. This ?statement bouquet? makes a welcome addition to a wake, funeral or graveside burial service. Style of container may vary.